That’s right. To own a playset of the cheapest version of every Magic card ever printed on MTGO would have cost you roughly $28,000 in September of 2016 before treasure chests were announced. One year later in September 2017 when Magic Arena was announced, that would have cost you roughly $22,500. Before Arena went into open beta September 2018, it would have cost you roughly $18,000. And now, roughly $14,000. Although it’s now cheaper to buy into MTGO than ever before, this precipitous decline is too much absolutely, and too much too quickly. As in paper Magic, players need to trust that their cards will have value in the long term for the market to be healthy. Right now we are seeing many people upset that their Modern and Legacy collections on MTGO have lost so much value. Although the market on MTGO has not yet collapsed, it is in some danger of doing so; drastic action is needed – and fast. So many panic-stricken people sold their collections in response to the Channel Fireball article and Magic eSport news that Cardhoarder and MTGO Traders have temporarily suspended their collection buying. While people and the market will come to their senses eventually – Magic Online will continue to be a platform that connects players to the new Mythic Championship series and provides the most affordable platform to play Modern, Legacy, Pauper, Vintage (and yes, Standard) – action is needed on Wizards’s part, and specifically on MTGO Product Manager Alli Medwin’s part, because the heart of the problem is that Treasure Chests, not Magic Arena, are predominantly responsible for causing this card value decline and making the Magic Online economy unhealthy. Once you read his article, you can tell that that is the opinion of Koch as well (but the truth wouldn’t have garnered so many clicks). The acceleration in the decline of prices is a necessary consequence of keeping treasure chest values fixed between 2 and 2.5 tix…it’s an economic truth and has little to do with Arena. If there is less overall value in the economy, you have to take a higher percentage of the system’s value to keep chests at that fixed price. Consider this revised take of the Biblical account of Jesus creating loaves and fishes: let’s say Jesus didn’t want to give a loaf of bread to each hungry person, but rather $2.50 worth of bread to each hungry person. He figures he needs to make 5,000 loaves of bread to accomplish this, and so he miraculously creates 5,000 loaves of bread and gives them to all these hungry people. But now that the market has had that major influx of bread supply, the cost of bread declines, so the amount of bread Jesus has to give to the next wave of hungry people must go up if he wants to maintain his goal of giving $2.50 worth to each hungry person. Those 5,000 loaves will become 6,000, which puts more downward pressure on bread prices than the original influx of 5,000, so the next time will be 10,000, then 20,000, then 50,000, and eventually there will be so much bread that bread will become worthless and Jesus will have to drop his goal. The moral of the parable is this: the amount of bread needed to be created and given away must increase at an accelerated pace to maintain the $2.50 figure, and likewise, the value of bread will consequently decline at an accelerated pace. 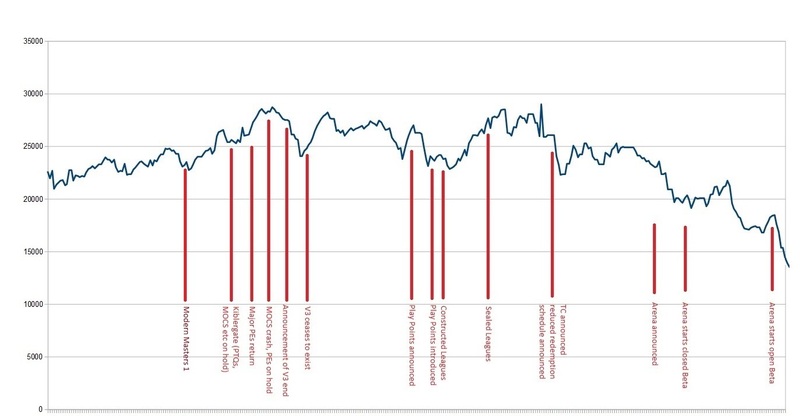 Right now we are in the midst of that accelerated decline, and it is wreaking havoc on players’ confidence in the MTGO economy and in the platform itself. Consider this an open letter to Alli Medwin. I’m here today to offer a few realistic longer-term solutions to keep the Magic Online economy healthy and strong. This means that roughly 76 percent of the prize support embedded inside TCs is value coming not from Wizards but from other MTGO users. Lee Sharpe, the inventor of TCs, is one wily fox, as he figured out a way to give players prize support without having it come from Wizards’s pockets. Imagine if a casino forced all of its patrons to give it their credit card numbers, and then every time someone hit a jackpot or won a poker game. the casino paid out these winners by charging a little bit from all the other patrons’ credit cards. That is what is happening here, and has been happening for two years now. The constant downward pressure on the market and constant devaluation of collection values thus caused must end if MTGO is to be saved. This method of prize support depends on an ever-growing user base to stave off collapse – it is not internally stable or sound in a closed system. This would cut the amount of non-redeemable product flooding into the system by at least 35 to 50 percent. That might not be enough, but this change would go a long way toward saving MTGO. Another remedy to too many cards flooding the market is to take cards out of the market. A dusting system for bulk cards introduced alongside Method 1 would further ease the downward pressure on the market. 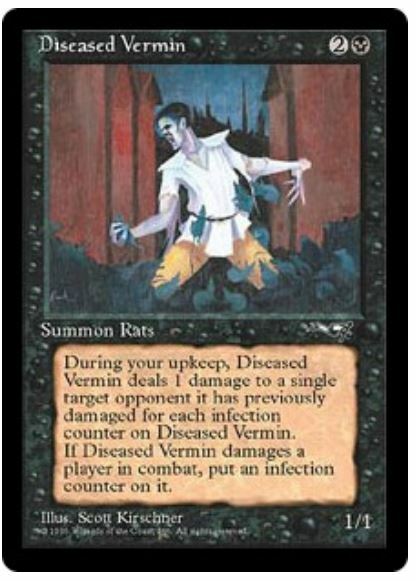 If Magic players were allowed to dust some number of rares/mythics, uncommons, and commons into play points or tickets, that would clear out some excess supply and would help keep some of the chest contents more valuable over time. I know, I know. “We don’t have the developmental resources to implement a dusting system.” That’s fine Alli, no problem! Set up some official Wizards bots that will pay 1 tix for 400 commons, 200 uncommons, 100 rares, or 50 mythics. Get cards out of the system that way. 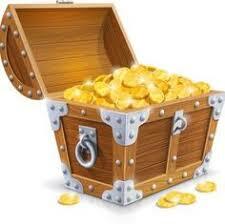 Also….have y’all seen how many treasure chests there are in the system? Look at GoatBots glutted inventory. If these chests weren’t tradeable, the economy would have already collapsed. 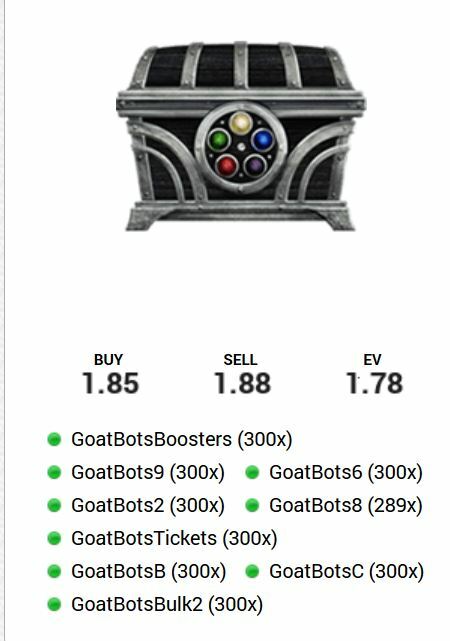 Use these Wizards bots to buy chests for 2.25 tix each. Or let them be used for a while as currency to enter events. Get them out of the system. A lot of chests are also pumped into the system through the weekend Format Challenges, so it’d be a good idea to reduce the number of treasure chests given as payout. Replace some of the treasure chests with real money and boxes of physical product like Ultimate Masters and Guilds of Ravnica. Alli Medwin could also take a page from the Arena playbook and reward players in the currency of time. Arena has taught us at least one thing — players want to be able to play more digital Magic for their dollar. Right now MTGO offers no way for players to enter into leagues or drafts without paying some sort of fee — the platform is built around a tournament gameplay model. One way to give players more game time for the same price would be to give players a free entry to an event every ten events they enter (perhaps reducing the amount of compensation slightly to compensate). Say, as part of the reward for participating in any event players receive a “phantom token,” ten of which can be redeemed to enter any event. If we want to push this idea further, we could increase the number of free entries given to players but preclude them from winning prizes when they enter with phantom tokens – the reward would exclusively be playing more Magic (and without added stress!). There are many different ways to take this concept and run with it. I personally came up with this method when thinking that Limited players should be awarded a phantom token after each Guilds of Ravnica Sealed or Draft event, ten of which could be redeemed for a Cube or Flashback draft entry. But what makes this method a part of a potential solution to the value problem is that it slows down the rate that treasure chests are pumped into the system. At any rate, the key take away is that players need to be rewarded in ways other than non-redeemable product. Reward them with more Magic. Reward them with play points. Reward them with redeemable product. But for the love of God, for the sake of the MTGO platform, for the sake of your long-term profits, and for your appreciation and respect for MTGO players, stop rewarding them with more Explorations and Noble Hierarchs than the market can bear. Arena has given you an opening here, as Limited demand has gone down even as Constructed demand has stayed the same or increased. Shift the contents of treasure chests accordingly – only strong and immediate action will re-instill confidence into the marketplace and make the economy fundamentally healthy again. Thank you for reading. This week we will hear details about how MTGO is connected to the paper Mythic Championships, which is something I had expected but needed to hear from the horse’s mouth. This is something that will give me and others renewed confidence in Magic Online and will make me likely to continue to be an investor on the platform. I haven’t made any buys since late September, but by the time this article goes live, I likely will have started investing in MTGO again. There’s never been a better time to buy, and if any of my Arena readers are interested in Modern or Pauper, now is your chance to buy a deck for cheap. This also means Guilds of Ravnica financial power rankings will be coming your way as a Christmas treat, so stay tuned for that! Please don’t hesitate to hit me up on Discord or in the comment section below with any questions and comments. Kyle started playing Magic with his little brother when they saw some other kids at a baseball camp playing. His grandma bought them some Portal: Second Age decks, and a hobby was born. Kyle played from Weatherlight through Invasion, then took a lengthy break until 2013. Now a PhD student in the humanities, the Greek mythology component of Theros compelled Kyle to return to the game. He enjoys playing Pauper and Limited as well as focusing on MTGO finance and card design. Follow him on Twitter at @KangaMage! I thoroughly enjoyed this article. Economics are everywhere!